Iowa Car Accident Amputation Recoveries | Hupy and Abraham, S.C. The moment of impact is over, but the impact of your car accident will never be over for you. It was the car crash that caused you to suffer an amputation and you must now live the rest of your life without your arm, hand, finger, leg, foot or toe. Your life will be different, but your life isn’t over. 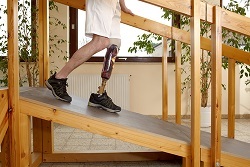 Medical expenses: Surgeries, medications to control your pain and prevent infections, frequent doctors’ appointments, prosthetics, and other medical expenses may be significant after an amputation injury. Lost income: You may be unable to work—or unable to work the same job or the same hours—resulting in a decreased income, after an amputation injury. Out-of-pocket expenses: You may require assistance with things such as transportation, self-care, caring for your family, and other necessary services. Pain and suffering: The physical pain and emotional suffering after an amputation can be severe and may continue for the rest of our life. While nothing can undo the significant injury you’ve suffered, you deserve to be compensated for these damages. However, if you fail to take action and to pursue a recovery then you will be responsible for your own damages. While the recovery is yours, you don’t have to be the one to negotiate with the insurance company or convince the court of your damages. Instead, you have the right to work with an experienced car accident lawyer who will fight hard to get you the fair recovery that you deserve after this type of car accident injury. To learn more, please start a live chat with us today.